We are pushing hard to finish my new car for the upcoming Evergreen Drift Pro-Am event on June 25th. Our goal is to have the car running by the end of today. As of this past weekend, there was a lot of work to do. The LS2 currently sits in the engine bay, but has yet to be wired since some front end fabrication is currently taking place. LS2 sits on Sikky engine mounts. While Gary and Alex work on the front end, Mark is working on the wiring and dash. The gas tank has been put in and the hatch was installed. Fabrication on the radiator and fan supports are continuing. We also are currently working on a transmission and shifter solution. We have a TKO transmission hooked up to the LS2 however the shifter location does not match the 240’s stock location. The new driveline we recieved will also have to be modified to make it work. We are using a 5-speed transmission as opposed to the 6-speed transmission that is normally mated to the LS2. XDC Vegas - Round 2 from Patrick Sean Kennedy on Vimeo. Alex, Ron, and Gary finished fabricating the roll cage for my 240SX, while I'm in Las Vegas competing in an XDC event. Hopefully my new car will be ready by the next Evergreen Drift event. Things are moving along fast! Gusset plates were added to improve strength and rigidity. The plate was dipple died to improve strength and save weight. The roll cage is complete; now it's time for prep and paint! A roll cage is a specially built frame which protects the occupants of a vehicle. A roll cage is a requirement for nearly all motorsports. Drifting is no exception! Roll cages are required to compete in most drift series and must be inspected and approved by the sanctioning body. I need a cage which meets Formula Drift requirements. I'm currently only driving at ProAm events, but the cage rules are very similar and I want to provision for driving in Formula D. In addition to passing technical inspection, the cage will also protect both myself and the car in the event of a collision. Before fabrication can begin, the 240 was stripped down. The inside of the shell was then sprayed with primer. Alex Laventure began fabricating the base plates for the roll cage. 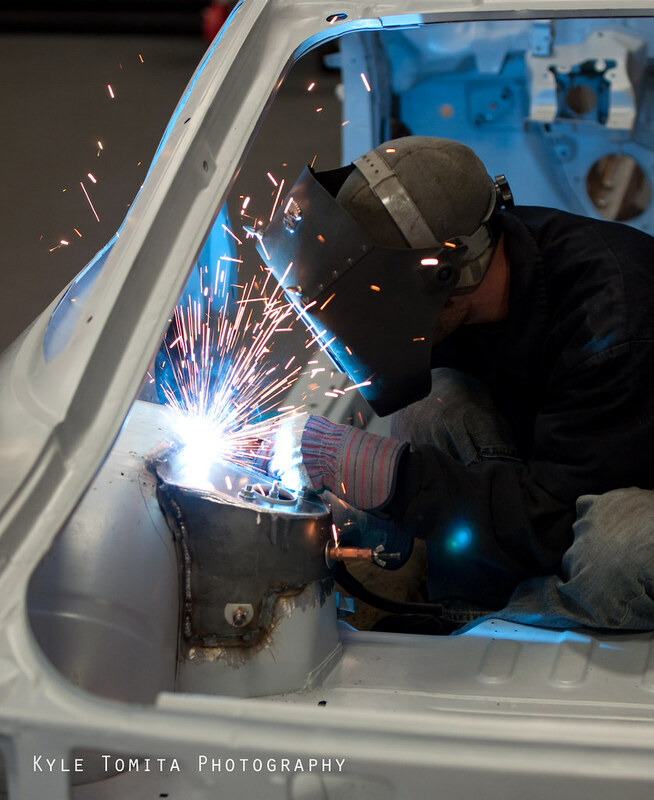 In this photo, you can see four base plates for the roll cage being fabricated. The base plates are fabricated out of multiple pieces of metal to fit the contours of the chassis. The base plate on the rear strut tower being fabricated. 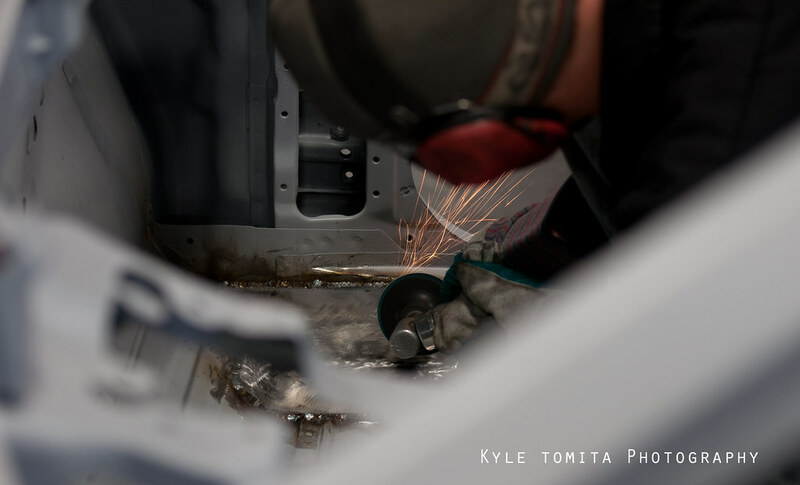 After fabricating the rear base plate, Alex Laventure welds the plate to the strut tower. After a base plate is welded in, Alex grinds down the burrs. The base plate is then primered like the rest of the chassis. The welds are left rough so that they can pass a tech inspection. If the welds were smoothed out, it would be harder for the inspectors to see them. Once the base plates were installed, the tube bending began. The tube needs to pass FD guidelines to be a race legal cage for their series. Alex welding the cage in. The cage in the process of being fabricated. Interior of the cage, still a work in progress. Check back for more details on this cage and the progress of the car being built!